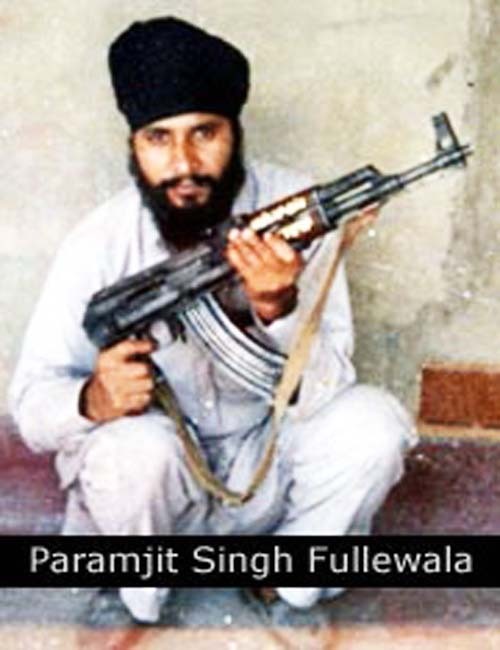 Bhai Paramjit Singh Fullewala Babbar was born in the house of Sardar Harnek Singh and from the womb of Mata Ranjit Kaur in the village of Fullewala. Bhai Sahib were total of five brothers and sisters. Bhai Sahib completed his primary education at a local school of Fullewala. After passing 10th class, Bhai Sahib helped his father in farming. Bhai Sahib worked at the family farms for over three years, then after Bhai Sahib opened a tyres garage near Sri Dam Dama Sahib in Talwandi Sabho. In June 1984, the Indian army attacked Sri Harimandir Sahib and killed countless innocent Sikh pilgrims, who had come to pay respect to Guru Arjan Dev Ji’s shaheedi. This mass murder of Sikhs stunned and changed Bhai Sahib for there onwards. Bhai Sahib’s heart wanted to punish the people responsible for the beadbi of Sri Akaal Takht and the killings of Sikhs. Soon Bhai Sahib came in contact with the local Khadku Singhs. While the Dharam Yudh Morchas were happening, Bhai Sahib’s uncle was arrested by Thanedar Meet Singh, who after brutally torturing Bhai Sahib’s uncle and later killed him in a fake encounter. This also had made Bhai Sahib realise the slavery Sikhs are suffering from in their own Punjab. Before joining the Sikh Freedom Movement, Bhai Sahib understood the full principles of the movement and then met Bhai Darshan Singh Ranjitgarh and Bhai Saadhu Singh Rode alias Naib. Both of these singhs had attained shaheedi after the Akalis and the police had teamed up. Before the shaheedi of these singhs Bhai Sahib had started doing actions in secret along with these singhs. One day as Bhai Sahib worked at his tyre garage in Talwandi Sabho, the police arrested him due to information being passed by a black cat. The black cat had told the police that Bhai Sahib hides guns and explosives in the tyres and then transports them to the Babbars. After a lengthy spell of brutal torture, the police charged Bhai Sahib with possession of explosives and also for accommodating Khadku Singhs. Bhai Sahib was sent to Bathinda jail, where he met Bhai Baldev Singh Janeer. Through Bhai Baldev Singh Janeer, Bhai Sahib became more spiritual and always meditated on the name of Waheguru. When Bhai Sahib was bailed from Bathinda jail, the police would daily harass Bhai Sahib at his family home. While being a part of Sikh Freedom Movement, close friends of Bhai Sahib from his group, Bhai Gurtej Singh Sewewala and Bhai Pavan Kumar had gone to see Bhai Gurdarshan Singh Kundha, but a black cat had informed the police and arrested these two singhs. Later the police killed these singhs in a fake encounter. The police of Bathinda arrested Bhai Sahib again but this time the singhs of Babbar Khalsa broke Bhai Sahib out of police custody. Now under the command of Bhai Balwinder Singh Ganga Babbar and Bhai Gurmail Singh Secretary Babbar, Bhai Sahib started doing actions in the Mansa area. This strong freedom fighting group of Babbars was a challenge and a threat to the government of Delhi. In the end that time also came when the singhs of Bhai Sahib, including himself were surrounded in the village of Mozian and faught the Indian security forces, such as Punjab police, BSF, CRP and also the Indian army, in a fierce battle. The singhs of Babbar Khalsa had bought the Indian security forces on to their knees. The locals also helped singhs by cutting down the large trees to prevent more army from entering the area. The Babbars destroyed 3 Indian bulletproof tractors and many army vehicles along with dropping many Indian soldiers to the floor. Even for the next two days after this encounter, the Indian security forces were collecting the bullet shells as well as picking up the bodies of the dead fellow soldiers. Fellow singhs, Bhai Gurmail Singh Secretary Babbar and Bhai Khem Singh Fauji Badal Kalan along with Bhai Sahib, stayed behind to push the Indian security forces, while other singhs such as Bhai Balwinder Singh Bullet, Bhai Balwinder Singh Ganga and Bhai Jugraj Singh Rasheen escaped. One of the Indian commandoes was on a roof blocking the singhs from escaping. Bhai Sahib spotted this commando and after moving close to the commando, a battle started between them, in which Bhai Sahib won and killed the Indian commando. The Indian commando had wounded Bhai Sahib badly. Bhai Sahib pulled self-written identity letter and placed it on his chest. Bhai Sahib started meditating of the true name of Waheguru. After 28 hours of an intense encounter, on 8th September 1991, Bhai Sahib attained shaheedi along with Bhai Khem Singh Fauji Badal Kalan and Bhai Gurmail Singh Raipur. Rest of the singhs had more than enough time to escape. The locals did not care for their own life and tried everything to distract the Indian security forces, but in the end nothing the locals did saved the lives of these three singhs. The police bought the bodies of the three shaheeds to the Mansa police station. When the families of shaheeds along with local panchayats went to the police station to get the bodies of the singhs, the police baton charged the families to install fear into them, but the family did not give up on asking for the bodies of the shaheeds and at the end the police had no choice but to hand the bodies over to the families of shaheeds. Before the police gave the family, Bhai Sahib’s body, the police inspector Sharma, bought Bhai Sahib’s sister, who had been married in the village of Hathewal, to the police station to identify Bhai Sahib.